Cases of Listeria infections in animals in South Africa are uncommonly encountered and on the few occasions when they do occur, the illness is usually in cattle and sheep. Listeria infections in dogs and cats are very rare, and only a few cases have been reported world-wide. As far as it is known, it has never been reported from dogs or cats in South Africa. Natural infection usually results from the ingestion of contaminated food. It appears as if stomach acid confers a degree of inhibition on infection rates in man, and this may also be so for carnivores. Listeria can be carried in the intestinal tract of dogs without them showing any apparent illness. A Japanese study showed that less than one percent of healthy dogs and no cats were carriers. When the rare cases of listeriosis occur in dogs and cats, it is usually associated with the ingestion of contaminated meats and meat by-products. Animals with a depressed immune system are more likely to become infected. Infected dogs may show signs of fever, diarrhoea and vomiting. Further signs such as septicaemia, encephalitis and abortion are infrequently encountered. Listeria is susceptible to commonly used antibiotics, such as penicillin and ampicillin, and they are the antibiotics of choice. Tetracycline and trimethoprim-sulphonamide are also effective. Listeria is intrinsically resistant to cephalosporins. Listeria is susceptible to pasteurization and boiling. Concern has been expressed in cases where dogs and cats have been fed the processed meats that have been implicated in the current South African outbreak. It is unlikely that dogs and cats will become ill, but if there is any concern about possible infection, a veterinarian should examine the affected animal. Hygienic measures such as hand washing after handling animals and before food preparation is crucial. Any skin wounds should be protected from contamination when handling possibly infected animals and items. Gloves should be used when cleaning up faeces. 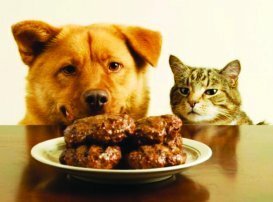 Feeding possibly affected products to dogs and cats as a way of disposing of unwanted products should be discouraged. The transport and storage of possibly infected items poses a risk to people handling such items and may spread the infection to other, previously uncontaminated, sites.